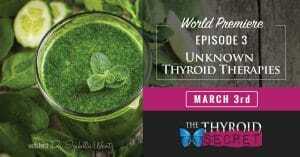 “Unknown Thyroid Therapies” was the episode that really started to dive deep into the details of what can help heal your thyroid disease. I got a lot out of this episode and am planning on implementing many of the treatments suggested, provided I can get my doctor on board for some of them. Dr. Wentz has done a lot of research on sites such as PubMed and has discussed innovative treatments with experts in various medical fields. A lot of this research is not publicized and as the name of the documentary alludes, it remains a secret to those who need it the most. She reveals many of them in this episode. Most doctors simply prescribe Synthroid or Levothyroxine to treat Hashimoto’s. And that may help many people with Hashimoto’s. 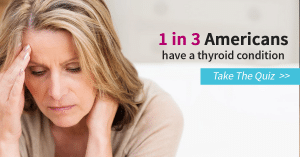 But many people continue to have annoying symptoms even on thyroid replacement. For those people, it would be beneficial to determine if they have trouble converting T4 to T3. If they do have trouble, the addition of T3 (Cytomel, etc) may improve Hashimoto’s symptoms. One of the most interesting unknown thyroid therapies that is currently being studied is low dose naltrexone (LDN). Low dose Naltrexone helps to balance the immune system, reduce inflammation, and promote healing in the gut. It essentially turns off the cells that cause autoimmunity. The great thing is that there are very few side effects to this treatment. Dr. Wentz goes into great detail about how it works. This treatment, of course, requires a prescription from your doctor. This is one I’m going to explore with my endocrinologist! If you want to try it, you’ll have to coordinate closely with your doctor as well. As you heal, your regular dosage of thyroid hormone may cause you to go hyperthyroid, so you’ll need dosage adjustments. Dr. Wentz is a big proponent of Functional Medicine.Throughout the documentary, Dr. Wentz interviewed many practitioners of Functional Medicine. It is a medical discipline that addresses the underlying causes of disease instead of just treating the symptoms. It involves treating the real causes instead of putting band aids on the problem. If your current doctor is not helping you to treat the root cause of your disease, a doctor that practices functional medicine may be a good option. Other briefly discussed topics in this episode include stem cell research and low level laser therapy. This episode alone made watching the documentary worth it. I now have a plan of attack to get my Hashimoto’s into remission and I’ll be referring back to this episode often. We hope this summary has helped you and given you some information to use on your own journey to remission. If you would like to get a copy of The Thyroid Secret documentary, click here => Yes! I want The Thyroid Secret! If you have found the information in this post helpful, please share it and spread the word!